Like the convenience of an instant PDF download but still want a hard copy of this book? Order both and save 25 percent! When AMITA Health set out to devise a more efficient method of moving its highest-risk Medicare beneficiaries across its care continuum, the newly minted Medicare Shared Savings Program (MSSP) accountable care organization (ACO) abandoned its siloed approach in favor of an enterprise-wide human-centric model of care. Centralized Care Management to Reduce Readmissions and Avoidable ED Visits in High-Risk Populations describes how the nine-hospital system inventoried, reexamined and revamped its care management resources, ultimately implementing a centralized care management model that would support the Institute for Healthcare Improvement's Triple Aim goals. 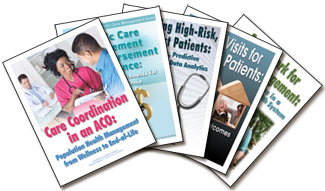 In this 25-page resource, AMITA Health's Susan Wickey, vice president, quality and care management, and Luke Hansen, MD, MPH, vice president and chief medical officer, population health, guide readers through their organization's care management redesign, which operates on the premise that AMITA's patients are never really discharged but only are transitioned to the most appropriate care site.